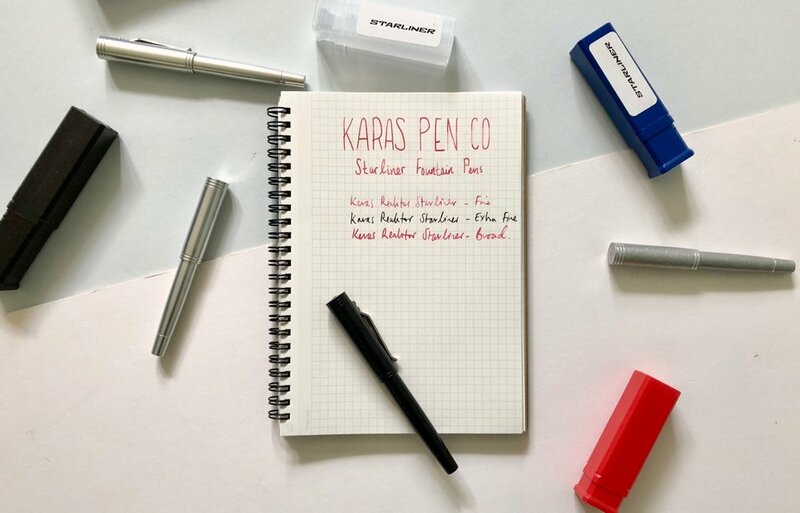 Karas Pen Co. sent me a selection of their Starliner fountain pens to review here on the blog. All thoughts expressed about these pens are entirely my own. 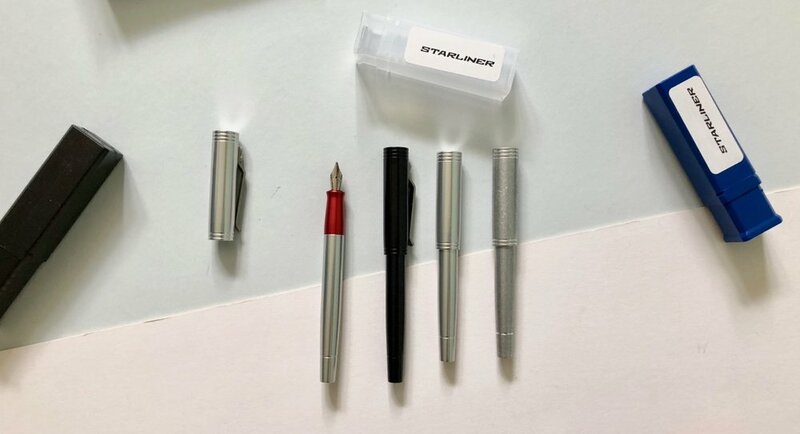 Last week I reviewed the Galaxie pen that makes up part of the Karas Pen Co upcoming launch of their Reaktor line of pens. This week I am looking at their partner, the Starliner fountain pen. The Starliner comes with a lot of the same backstory as the Galaxie pens. There are two different sizes, the pocket and the XL. The colour options and materials are the same on both pens, however the Starliner has a few subtle differences that make these stand apart from the Galaxie. The Starliner follows the same simple aesthetic as the Galaxie pen in that familiar Karas Pen Co. style. There is less flourish on the cap of the Starliner, when you compare it against the Galaxie. The top of the pen cap has a small raised peak, but no cog. 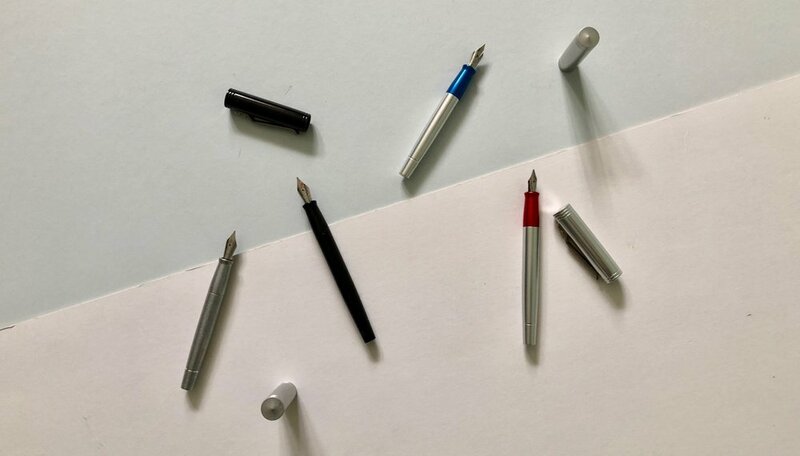 There are three machined rings at the very top of the pen cap, two at the bottom and one on the bottom barrel of the pen itself. These represent a countdown, such as you would see in a space launch. This is again different to the Galaxie pen and sets the two apart. 3-2-1 countdown on the Starliner pen. The pocket Starliner takes standard cartridges and ships with a Monteverde black cartridge. The XL version comes with a K5 Schmidt converter, which immediately makes this a more attractive pen for my personal use. They come with the 076 Bock nibs similar to other Karas Pen Co fountain pens. I have found these pens really nice to write with, all through the different nib sizes. The Starliner fountain pen follows the same pricing as the Galaxie hitting that entry level. The pocket will come in at $50 and $55 for the XL. Similar to the Galaxie I preferred using the XL version of the Starliner fountain pen. I like the fact that I can use any of the inks I had on hand. The additional length you get with the XL is far more comfortable to use and with the ink options makes this a lot more adaptable. However personally I prefer the aesthetic of the pocket pen mainly due to the lack of the clip. The good news is the pocket Starliner is a tad longer than the pocket Galaxie, as you can see in the photo below. The additional length makes the pocket Starliner comfortable to use unposted, an issue I had with the Galaxie. As with the Galaxie range, the full black version of the Starliner is probably my favourite, it just looks so sharp and clean. I can’t quite help but compare the Reaktor pens to the other Karas pens I have used in the past, the Ink, the Decograph, the Render K and the Retrakt, and there is a distinct difference. Therefore if you’re familiar with or own any of those pens, the Reaktor range is different. But different doesn’t mean they’re worse. These pens are great, reasonably priced and do give you two good options of pen styles based on your preferred style. All of the colour combinations. I like what Karas Pen Co. have done with their new Reaktor range of pens. They are really nice to use and don’t compromise on that Karas feel. Creating a range of entry level pens is a good move. Thank you again to the guys at Karas Pen Co. for sending me these pens to play with and review here on The Finer Point.